It seems that spring has well and truly sprung here in Sydney and summer is definitely not showing any signs of slowing down any time soon. I don't know about you guys, but I kinda have a love hate relationship with warmer weather. Yes I love wearing less layers, floaty sundresses, lot's of coral orange lippy, enjoying balmy evenings and countless days spent beachside - but all of that good stuff means that more skin is suddenly on show. Now, I am extremely pale (can you tell by my hand above) and add that in with the fact that the peach fuzz that have been sporting on my legs for the last few months is suddenly gone out of style, I often find myself in a high maintenance pickle every week. It goes a little something like this - shave, exfoliate, tan, moisturise, exfoliate repeat. No one really has the time or energy for that right? Or just me? Call me lazy but I am never ever bothered for those shenanigans every darn week. That's where this baby comes in, the Philips Satinelle Advanced Wet & Dry Epilator*. 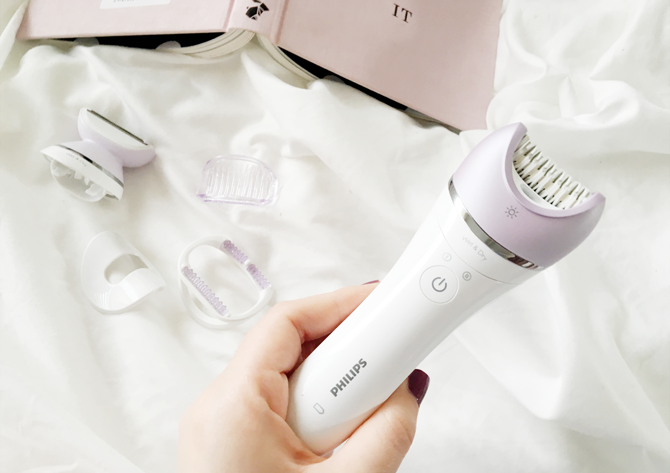 It may look a tad scary, but I'm here to tell you why you need this Epilator on your radar for silky smooth legs all summer long. In a nutshell, an epilator is a lot like a whole bunch of rotating tweezers. The Philips Stainelle Epilator in particular works to lift and gather lying hair, guide them to a pulling point then firmly grabs and pulls out the hair. 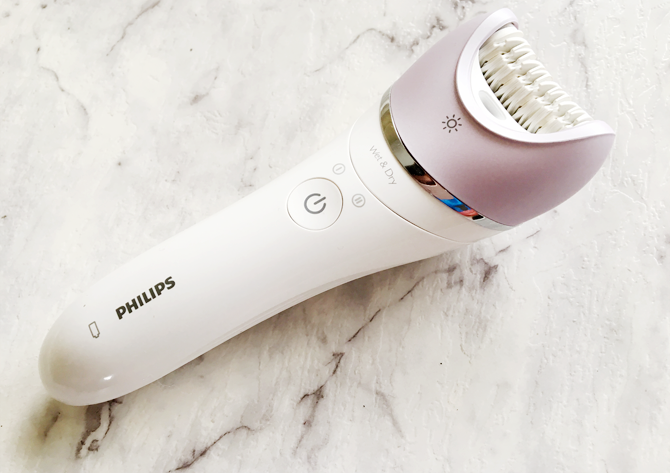 I have no previous experience with an epilator, but this one is made from ceramic material with a wide epilator head, which Philips say give optimum results by even being able to grab small and fine hairs. What I like about this epilator is that it comes with an assortment of accessories for different results, such as shaving head and trimming comb, a cap for facial hair removal, a delicate area removal cap for underarms and bikini lines and a massage cap to help ease the epilation sensation. Conveniently, this epilator has a S-shaped handle for a nice comfortable grip and control, as well as a nifty little light that helps you pin point even the most stubborn and small hairs. Better yet, this Epilator can be use wet or dry and is easily portable due to its rechargeable batteries. Now, I must admit though, I was very hesitant (read: shitting myself type scared) to use it. I came up with all sorts of reasons why I didn't need to remove my leg hair just yet etc etc. until I just decided to go for it. I read a lot of reviews online before hand about epilation tips and gathered that it was best to use the epilator after exfoliating and showering so that the skin was still warm and thus making hair removal easier and as pain free as can be. The instructions indicate that the best way to use the epilator is to hold it a 90 degree angle just hovering above the skin and move slowly in the direction that your hair grows, so basically from your ankles upwards. 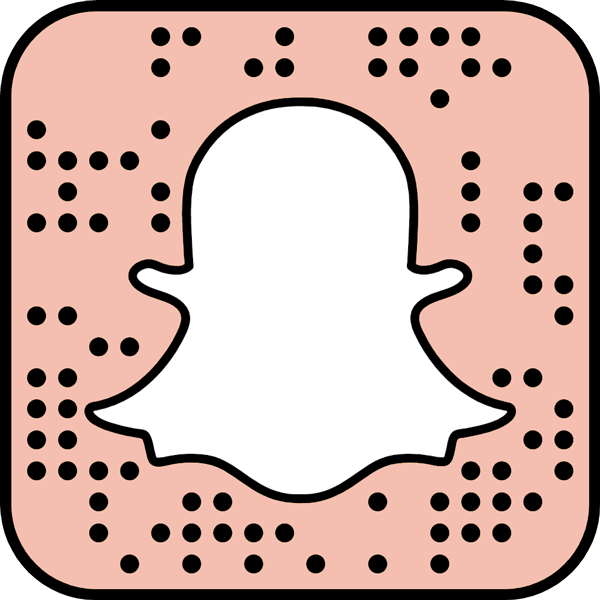 I will admit I was very very surprised with how I found my epilation experience so to speak. I fully expected to hate it and never want to try it ever again, but instead I ended up really really loving it. Now I'm not going to say it doesn't hurt, because it does, especially in the beginning, but within 5 minutes I was already use to the sensation. I would describe the feeling similar to little zaps on the skin, and not at all unpleasant - and this is coming from someone who has a very low pain threshold! The feeling is incredibly bearable especially if you are used to threading/plucking your eyebrows. I will say I much prefer using an epilator over waxing any day! What I love most about this Epilator is the end results. The first time I used it I did have a few issues with missing small tiny hairs but that was easily fixed by going over the area again, a little annoying yes but in my opinion well worth the hassle. When I had finished removing my hairs from both legs, my skin was left feeling soooo silky smooth, but most importantly hair free. But the best part for me is that my legs were left hair free for a lot longer than usual - 1.5 - 2 weeks to be exact (amazing, I know), especially when I was previously shaving minimum once a week. In fact since I started using the epilator last month I have only had to use it twice - a big win for all us lazy girls out there! I haven't tried the shaving component of the epilator because quite honestly I am so impressed with it as it is I don't see the need. The only downside to using an epilator much like waxing is that the chances of getting ingrown hairs is much higher. However, this is easily manageable with regular exfoliation which I do anyway thanks to my good friend fake tan. I will most likely be using this baby all through summer and quite possibly all the way through next winter too! The Philips Satinelle Advanced Wet & Dry Epilator retails for $149.95 at Myer or The Shaver Shop. 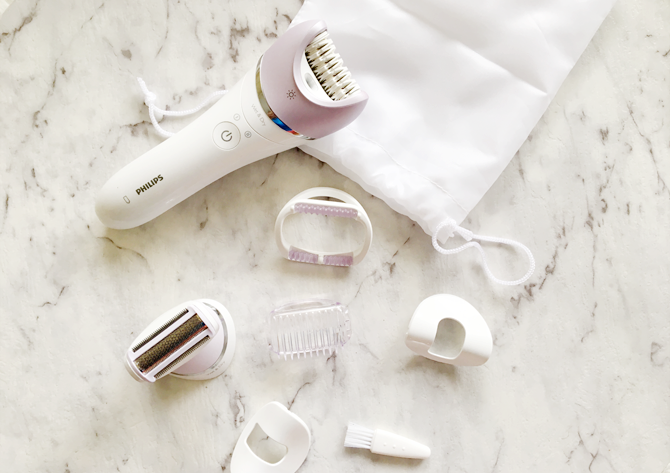 Have you tried an epilator before? What was your experience? Let me know in the comments below! Awwww, the sunny weather have not yet hit Melbourne! Still rainy days here! Oh yessss, I have come to love the epilator ever since I started using it! I just love how long the results last. It hurts at the initial attempt but you do grow used to the sensation after a few uses. I'm one of those people that are scared to use an epilator as well! I've heard that for a lot of people they find it really painful and I'm such a sook when it comes to things like that. You've made me a little more curious rather than chicken scared though, maybe I'll look into it!